Olivia Glazner joined Berkey Williams LLP as one of the Firm’s 2018-2019 Indian Law Fellows. Olivia earned her B.A. from the University of San Diego, where she majored in Ethnic Studies and first became interested in pursuing a career in Indian Law. In 2018, she earned her J.D. from the University of Oklahoma College of Law, graduating with a certificate in Indian Law. Olivia completed OU’s dual-degree program, also earning an M.A. in Native American Studies with a concentration on tribal governance and policy. 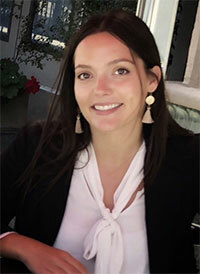 While at OU Law School, Olivia served as the Articles Development Editor for the American Indian Law Review, and spent two years on the executive board of the Native American Law Student Association (NALSA). She also participated in the 2017 NALSA moot court competition and attained a certification in Indigenous Peacemaking. Olivia obtained practical experience as a legal intern at Oklahoma Indian Legal Services in Oklahoma City, and later doing research for the National Parks Service’s National NAGPRA (Native American Grave Protection and Repatriation Act) Program. She also had the opportunity to visit Belize as part of OU’s Indigenous Human Rights Clinic, submitting a report to the United Nations Human Rights Council on compliance with UN indigenous rights recommendations. As an Indian Law Fellow at Berkey Williams LLP, Olivia will apply her legal education and experience to work on behalf of tribal clients in all of the firm’s practice areas.